Vidor will play Santa Fe High School, which is still healing from a May shooting that claimed the lives of eight students and two teachers. VIDOR — The Vidor Pirates' homecoming celebration will look a little different Friday night. 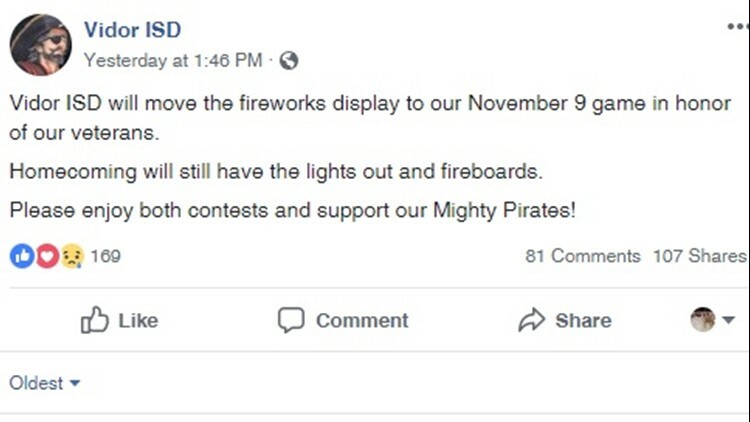 The school district announced in a Facebook post that it would be postponing its annual homecoming halftime fireworks show. Vidor administrators says the fireworks will be moved to November 9th to honor Veterans Day. The district says its decision doesn't have anything to do with Santa Fe. Vidor is widely known for its special show where they turn off the lights and perform with glow sticks and bracelets. The fireworks typically follow. Our news partners at the Beaumont Enterprise released a statement from Vidor head coach Jeff Mathews alluding that the show was canceled out of respect for the students and fans at Sante Fe. "If this decision helps one kid at Santa Fe, then it was absolutely worth it," Mathews told the Enterprise. Vidor’s decision came just one day after Santa Fe High School principal Rachell Blundell sent out an email advising parents of Vidor's homecoming traditions, including the fireworks display. She said in the press release that their would be counselors and resources available if students needed to go somewhere quiet during the show. Vidor administrators insist they did not make their decision as a rebuttal to Santa Fe's message to their participants. Coach Mathews tells 12News, "We made the choice to move the fireworks to honor veterans later in the season. I think it's the right decision, the right thing to do."